In recent months, the Ministry of Health had organised a series of meetings with major stakeholders (including the Academy of Medicine) to seek their views and opinions on the proposed transformation of the health care delivery system in Malaysia. Currently, we have a dichotomous system; the public system which is heavily subsidised by the government and the private system where patients pay out of pocket or have their medical expenses partially or fully covered by their employers or private health insurance. This system may have worked quite well in the past but it is clear that as time passes, it has become increasingly unsustainable. In 2008, the public system looked after 78% of hospital beds in the country and cared for 74% of all admitted patients. Yet only 55% of all registered doctors (excluding housemen) are in the public system. However, the health expenditure in the private system was higher at 16.68 billion ringgit in 2007 compared to 13.54 billion ringgit in the public sector. Our expenditure on health has also escalated rapidly over the last decade. The expenditure in 1997 was only 5.6 billion ringgit for the public sector and 5.5 billion for the private sector. Accelerating inflation in health care costs is therefore becoming a major challenge. The current system is therefore an inequitable system with many discrepancies. The inequitability is applicable to both patient and health care provider. Also specialists are performing tasks that could be as competently performed by less qualified personnel thus unnecessarily pushing up the cost of health care. The economic efficiency and sustainability of the current system are issues that would require urgent attention. The proposed restructured national health care system aptly called 1-Care aims to be responsive and provides choice of quality personalised care, ensuring universal coverage to meet the health care needs of the population. It is to be an integrated health care delivery system designed to narrow the discrepancies between public and private. There is greater equitability in access and financing, making it more efficient in delivering higher quality care for better health outcomes. To some extent, it will also reduce the “brain drain” from public to private. 1-Care envisages a stronger stewardship role for the Ministry of Health which will largely be involved in formulation of policies, strategies and standards. It will continue its functions as a regulatory and enforcement authority and play its role in public health, training and research even though it may no longer be the main service provider. There is now good evidence that a health system that is oriented towards primary care is more effective and efficient in producing desired health outcomes. In the proposed system, the primary health care physician will play a pivotal role in providing personalised, comprehensive and continuous care across the entire life cycle. The primary health care physician will also play the crucial role of gatekeeper as using secondary or tertiary care centres as entry points into the health care system is inefficient and increases costs. There will be a strong focus on health promotion and disease prevention. The current government hospitals will have an autonomous management structure and function as non-for-profit entities while remaining accountable to the Ministry of Health. At both primary and hospital levels, financing will be through case-mix adjustments. It has been proposed that the financing will be through mandatory social health insurance contributions from the individual, the employer and the government. A fairly financed system would ensure that patients are not deterred from seeking care because of required payments at time of service. Every individual should pay approximately the same proportion of their income largely in the form of pre-payment and is protected from financial catastrophes as a result of paying for health care. There is risk pooling and social justice in that the rich help pay for the poor and the healthy help pay for the sick. Safety nets are also provided for the highly vulnerable groups. Such a system should benefit all major stakeholders. The individual benefits from having access to both public and private providers. There is more personalised care delivered nearer to home by a specific primary health care physician and there will be better access for the vulnerable groups. The focus on wellness will also result in healthier individuals. Employers benefit from reduced administration to process medical benefits and avoid higher expenditure arising from unnecessary care. Moreover, a healthier workforce ensures higher productivity. For the health care provider, the gaps in remuneration and workload between private and public will be bridged to some extent and the system will create a more effective demand for healthcare. The nation will benefit through a system that addresses equity and access to health care thus promoting national unity. The rapid growth in health care costs is more effectively contained and such a system will ensure a more cost effective utilisation of limited resources. Obviously, there is much more that needs to be done and put in place. There are many details that need to be worked out and many painful challenges will have to be overcome in its implementation. Health care reform is urgently needed in our country and perhaps it is already a little bit overdue. The experience of the United States should serve as a lesson for us all. As leading and senior medical professionals, the fellows and members of the Academy of Medicine must be willing and prepared to play an active role in this transformation process and to contribute positively to a better health system for the people and the nation towards achieving Malaysia’s Vision for Health. It gives me great pleasure to extend a warm welcome to the participants to this Media Workshop. Dr H C Ong, Chairman, Technical Committee for the preparation of the CPG Documents. Dato’ Dr N Sivamohan and Members of the Technical Committee CPG Document. The College of Obstetricians and Gynaecologists is one of the nine Colleges that make up the Academy of Medicine of Malaysia. The strategy of the College is to work in teamship with other relevant organizations in the implementation of the College’s educational programmes. The College is actively involved in the education of medical professionals and in the field of O & G bringing to them updated knowledge in the field. 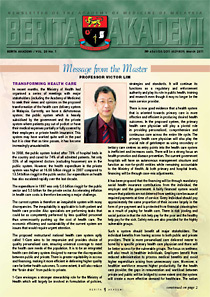 The CPG Committee, under Chairmanship of Dr H C Ong appointed by the College of O & G, is proud to collaborate with the Ministry of Health Malaysia, the Malaysian Menopause Society, the Obstetricial and Gynaecological Society of Malaysia and the Academy of Family Physicians of Malaysia in the production of College of O & G Clinical Practice Guidelines Document Hormone Therapy During Menopause in Malaysian Women to help doctors not only to understand hormone therapy but also to ensure the quality care in service. The improvement of health care and reduction in mortality has resulted in an increase in the life expectancy of Malaysians. The overall projected population increase from 27.8 million year 2010 to 35 million year 2020 and concurrent with the projected increase in the older aged population 60 and above and with increasing longevity for women. Menopause has become a major life event for the older women whose life expectancy is longer than the life expectancy of men. The College of O & G follows the strategy in advocating promotive health, preventive, and curative programmes to ensure for the older women a good health and a good quality of life. Menopause women during the golden phase of life continue to play an important role in the family, home, work place and community and are important key in the socio economic development of Malaysia and Satu Malaysia. 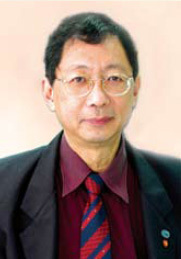 The College of Paediatrics is pleased to inform the Academy of Medicine of Malaysia that one of our members who is also an Executive Committee council member, Professor Cheah Fook Choe, has been granted a prestigious prize of ASPR Best Research Award for 2011. Professor Cheah will be presenting the abstract entitled “GM-CSF Is Not Required For Macrophage Recruitment but Modulates the Accumulation In the Perinatal Mouse Lung” at the PAS-7th ASPR Congress in Denver in 2011. The College would like to congratulate Professor Cheah on his outstanding achievement. 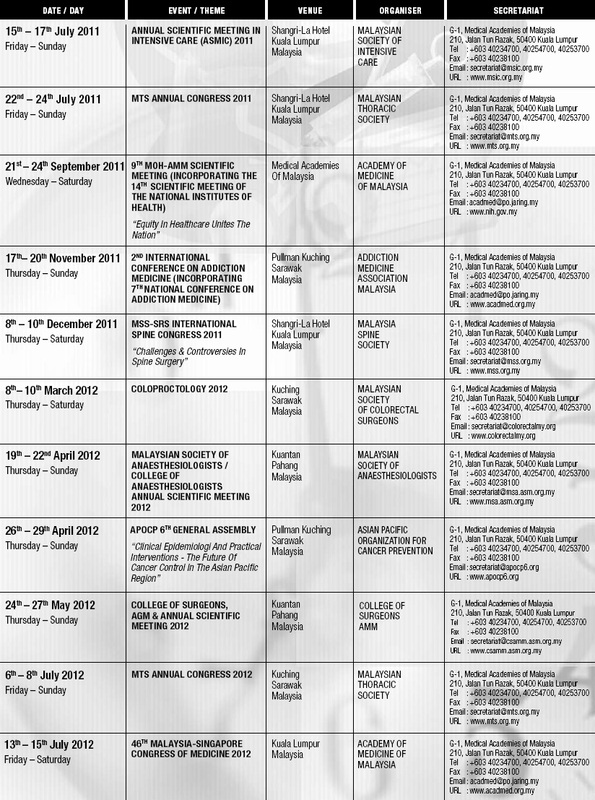 The Opening Ceremony and AMM Conferment and Induction Ceremonies will be held from 1400 hrs on 22nd September 2011. Poster submissions are welcomed. The closing date is 31st July 2011. A cash prize of RM1,000 each will be given for the three best posters. During the last Annual General Meeting of the Academy, a workshop on Strategic planning was conducted. It was attended by members, representatives of the various colleges and several past Masters. It was a successful event and there were many suggestions and inputs from the participants. The idea for a strategic plan for the Academy was mooted several council meetings ago. The Academy in several ways was in a transitional state, and hence the need for a renewed vision and vision. There were a number of developments in the last few years that directly impact on the Academy’s activities which prompted this strategic planning. The Academy enjoys the confidence of the Ministry of Health which has increasingly been involving it in a number of activities. Amongst these is the National Specialist Register. One of the proposed amendments to the Medical Act of 1974 is the establishment of the Specialist register. While waiting for the amendments to be passed by Parliament, the Malaysian Medical Council has given a grant to the Academy to develop the Register. This has been successfully done and specialists now apply to the NSR to be credentialed. Another development is the Continuing Professional Development programme. Again, the MOH entrusted the Academy to handle the Specialists CPD activities. In its own activities, the Academy has also expanded the scope of its activities. The Malaysia-Singapore Congress of Medicine has now become a tripartite meeting with the involvement of Hong Kong’s Academy of Medicine. The Academy is increasingly taking an active role in the training of Specialists. Recently, the Academy after so many years, has finally got a building of its own (it shares the building with the Academy of Family Medicine which owns a third of the property). The building is the result of many years of planning, fund raising and hard work. It is the pride of the Academy but at the same time, has increased the financial burden of the Academy. In the light of all these developments, the council decided to develop a strategic plan to take the institution to a higher level. Dr Zaki Morad, the Deputy Master, was delegated the task of organising the workshop. The Council did consider engaging a consulting firm to help develop the Strategic plan but as the price of such a service was costly, it was decided to do it in-house. In the two months preceding the workshop, three workgroups were formed, each to look into specific areas in preparation for the workshop. Professor Victor Lim, the Master, led a group that looked into the Vision and Mission statement. Dr Zaki Morad chaired another group that looked into the Academy’s activities, while Dr Chang Keng Wee’s group studied options for a new organisational structure and ways to improve the financial standing of the Academy. At the AGM on the 8th August of 2010, the suggestions of the groups were presented. There was an active discussion led by several members. Past masters including Tan Sri Dato’ Dr Abu Bakar Suleiman, Dato’ Dr Yeoh Poh Hong and Professor Dato’ Dr Kew Siang Tong made a number of suggestions; most of which were incorporated in the final draft. our role as an authority, resource and advisor in matters related to specialist practice”. To achieve this mission, it was proposed that the Academy embark on a number of CME/CPD activities in collaboration with the MOH. It was also felt that the Academy should have more say in Medical education in the country. The Academy should also take the lead in effecting changes in medical practice. There should also be an outreach programme for doctors and public. There was a consensus that the organisational structure of the Academy be strengthened and upgraded in anticipation of the increased responsibilities and workload of the Academy. This may include the appointment of a CEO, executives for finance, administration, programme and also to look into the affairs of colleges. A suggestion to appoint eminent members to the Council in addition to elected officials and College representatives was not accepted as was the suggestion to change the election system where officials are elected en bloc for a three-year term. An interesting suggestion which was accepted by the members present was that two members under the age of forty be nominated to the council. There were a few other suggestions which the Council will have to look at in follow-up actions. Special rates have been arranged with the Pulai Springs Resort. The closing date is 10th JUNE 2011. Please come and join us for the tournament. 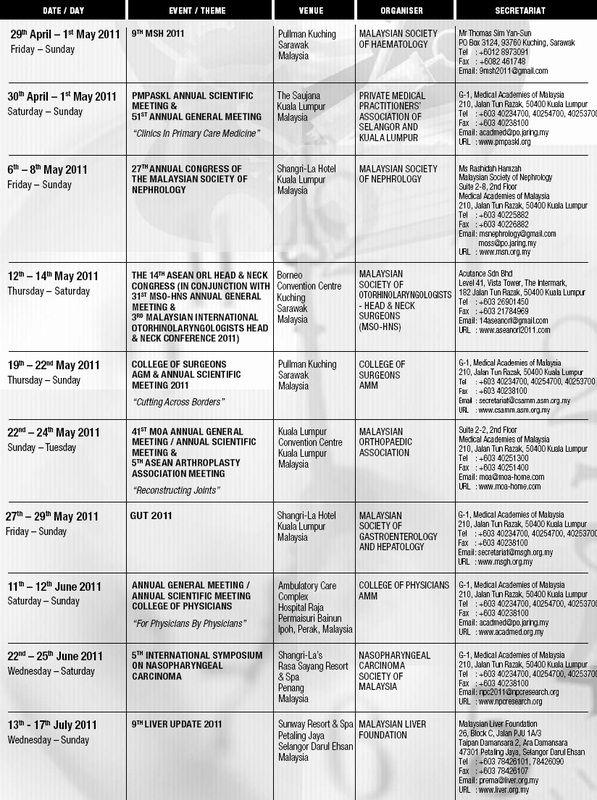 The College of Surgeons, academy of Medicine of Malaysia organises a golf tournament every year. This is to promote fellowship and camaraderie among fellow surgeons. Updates in the fields of cardiology / gastroenterology / endocrinology / rheumatology / respiratory medicine / neurology / nephrology / infectious disease. Workshops on learning new skills e.g. difficult ECG, microscopy in rheumatology, etc.